Monogram released six kits in conjunction with the Shogun Warriors release in the US: Grandizer, Raider, Gaiking, Raydeen, Great Mazinga and Dragun. These kits were from existing Japanese molds (evident in the choice of plastic colors...all these kits came in at least 2 different colored plastics so painting was unnecessary). It's my belief that the kits were released in the US as two different groups based on the box graphic - I think the black banner across the Mazinga, Raydeen and Dragun boxes indicate a closer tie-in with the first release figures so they may precede the three other kits. The boxes for Raider, Gaiking and Grandizer have different graphics - at the very least there were probably two model assortments. 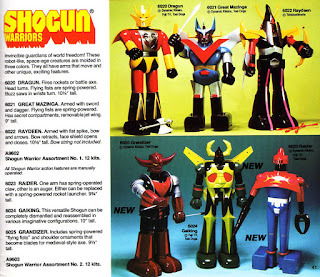 Grandizer was shown in Europe as Goldorak or Goldrake and Atlantic of Italy released 4 kits for the series. The Goldrake kit is shown below. Mazinga is molded in royal blue, red and silver, and a little painting makes a very cool kit. Raydeen is molded in black, yellow and red. Two interesting features are his slide-apart face shields and his retractable bow. This is one of my favorite Shogun kits. He's molded in red, yellow and silver. A really cool kit molded in black and yellow, Gaiking can swing his arms and legs. One of the cooler kits, Grandizer is molded in black and burgundy, so some painting is required to achieve a semblance of the original figure. 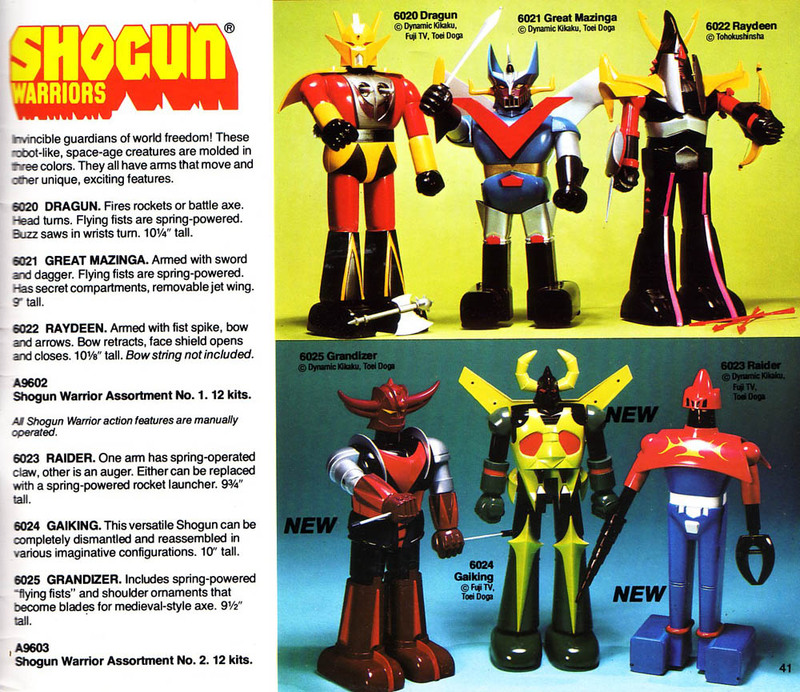 The Raider kit was actually Getta Robo 2 repackaged under the Shogun title as Raider. The kit is molded in red and blue. One of four Atlantic Goldrake kits, this 7" tall kit is the actual robot and is molded in yellow, blue, red and grey.